Join Art.Science.Gallery. 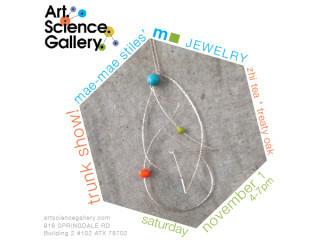 for a trunk show of m2 JEWELRY with Austin artist and engineer Mae-Mae Stiles. Stiles' unique work often has vintage elements dating to the 1900s, including semi precious stones, recycled glass, wood, pearls, crystals, amber and vintage lucite. Her modern, minimal, colorful designs evoke a sense of wonder expressed in mid-century design about science and exploration. She'll also be revealing custom jewelry based on the Art.Science.Gallery. logo. Admission is free; Suggested donation of $5. Zhi Tea, Treaty Oak Distilling Co.